What a great idea for a Christmas Present ! Pick your cakes up locally in Drouin 2018 at the Drouin & District Community Bank. Contact our Cake Chairman prior to Christmas for your Christmas Cakes and Puddings. 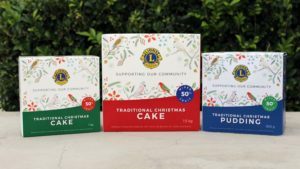 Any other Drouin Lions Club member will be happy to help also if you would like a Christmas Cake or Pudding.